Popcorn for breakfast? Don’t mind if I do. 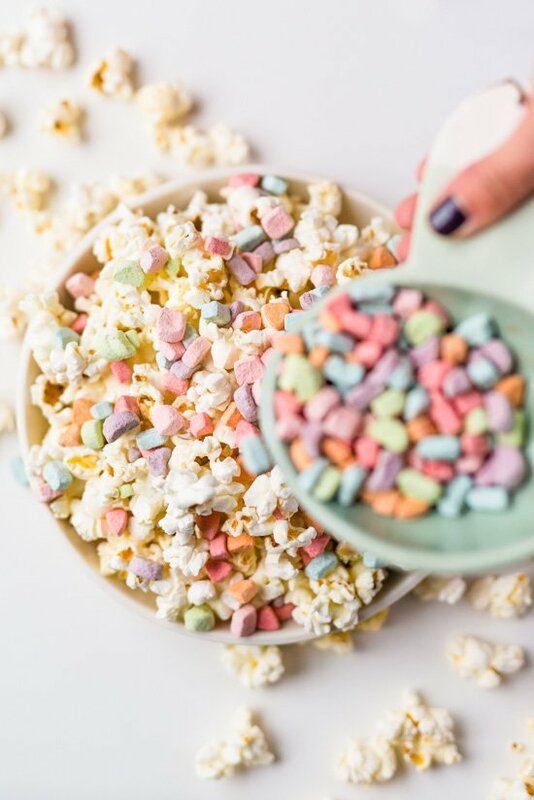 After my mini popcorn party from last month, I got a ton of suggestions for crazy good popcorn combinations (which you can see here) from you guys. Thank you! So, I thought I would share a few of those popcorn ‘recipes’ today to kick off the week. Because Mondays are hard. 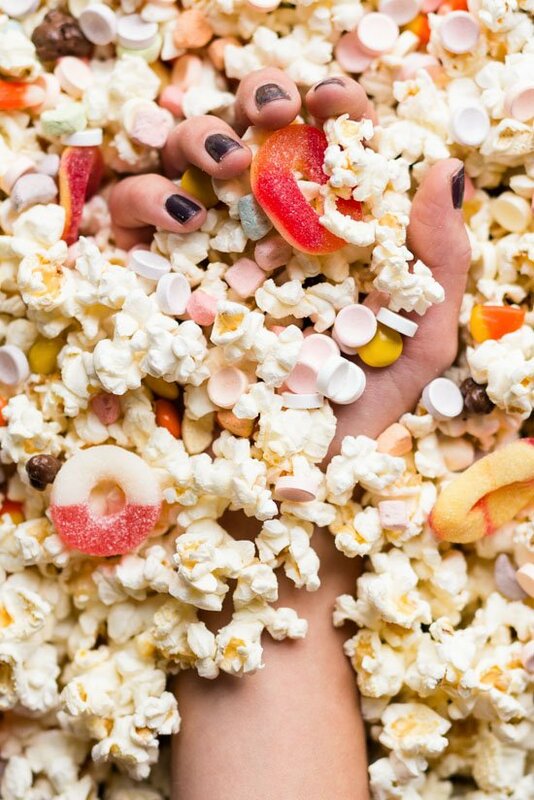 But popcorn plus candy will make everything better…Or at least more tolerable. 1. 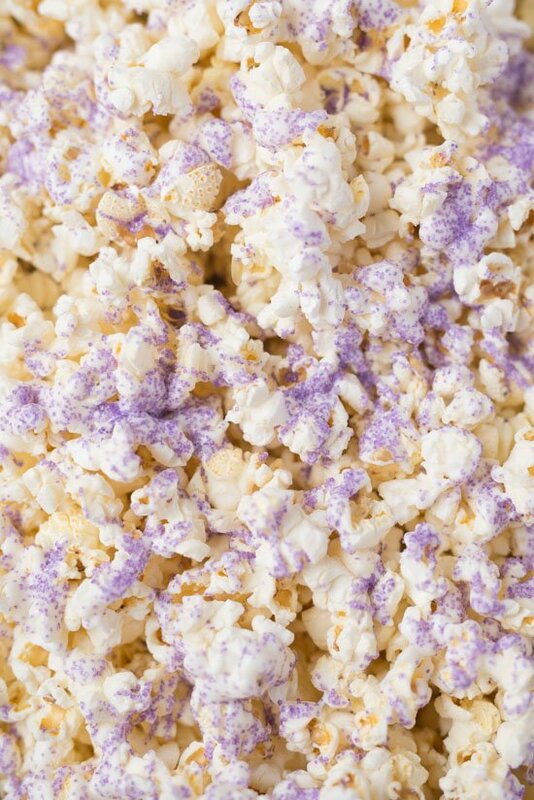 White chocolate sprinkle popcorn. Yes, yes, yes. This was a crowd favorite when we were taste testing. 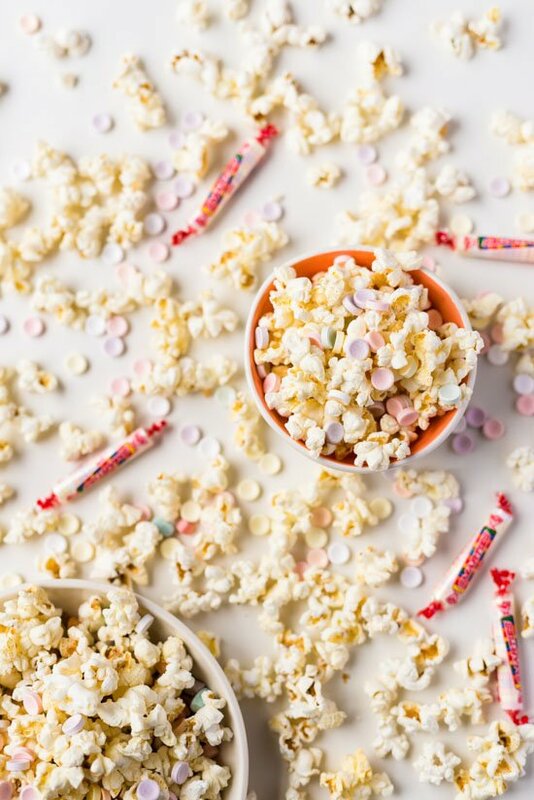 Just melt white chocolate or almond bark in the microwave (or on the stove), drizzle over popcorn, and add sprinkles. 2. 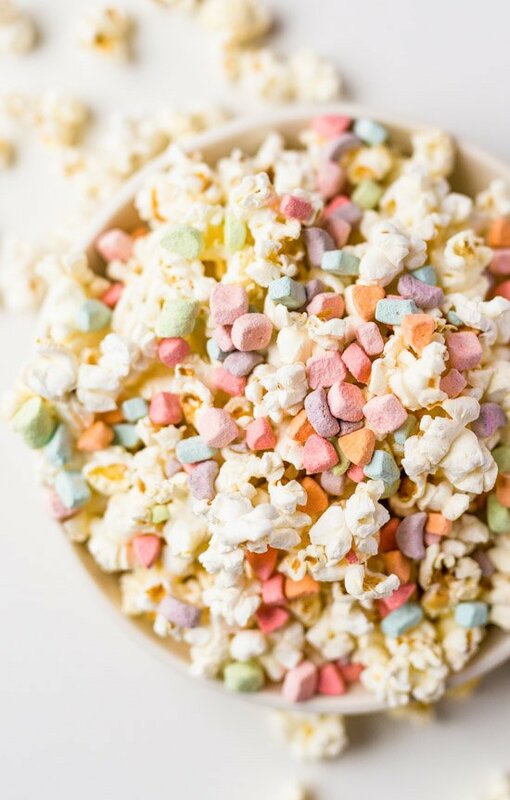 Lucky Charms marshmallow popcorn. I’m pretty convinced that dehydrated marshmallows taste good with everything! I mean, I used them in a fudge recipe. Enough said. If you don’t want to spend hours plucking out the marshmallows from a cereal box, buy this big bag of presorted marshmallows instead. 3. 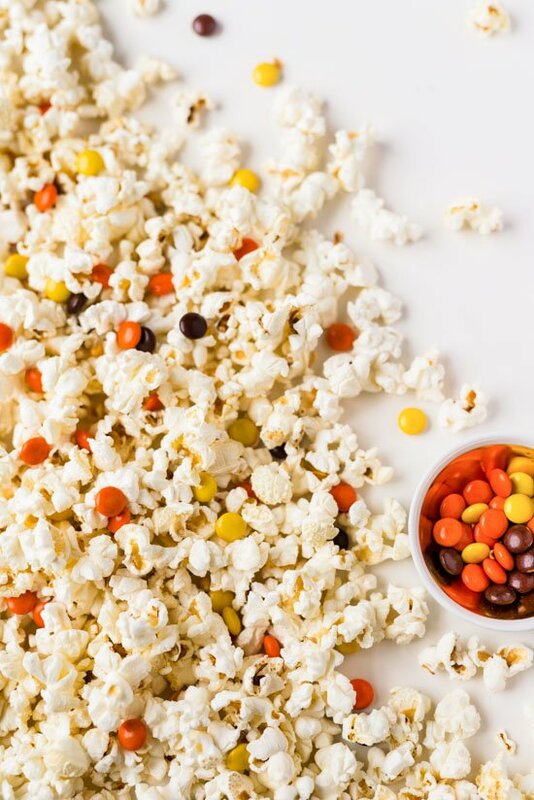 Reese’s Pieces Popcorn. Yum! I love RPs, so this combo gets a big thumbs up. 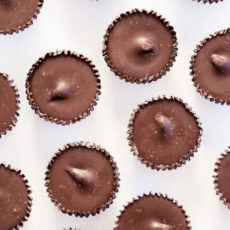 Toss the Reese’s in when the popcorn is still hot and they’ll melt in. It’s a little messy, but it’s worth it. 4. 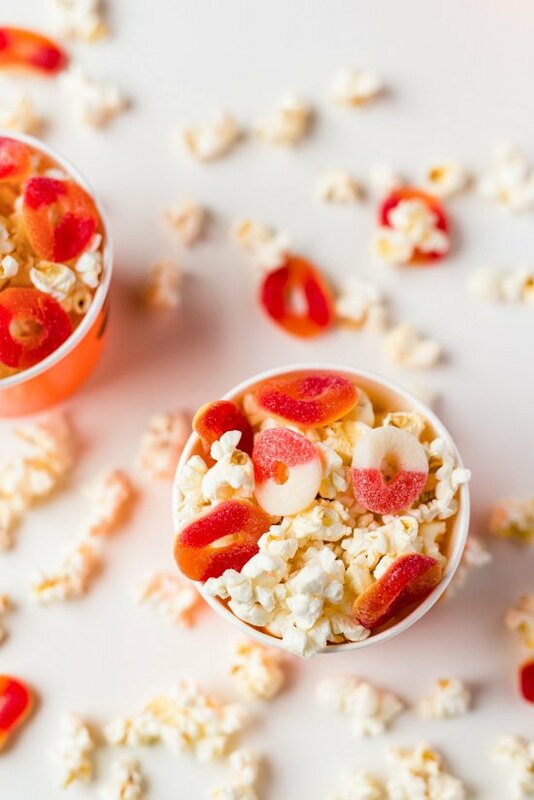 Fruit gummies popcorn. This combo is a little bit more out there. But it’s still good. I especially like watermelon or peach rings for this. 5. Chocolate Lover Popcorn. This one is Reese’s Pieces, mixed with Buncha Crunch. 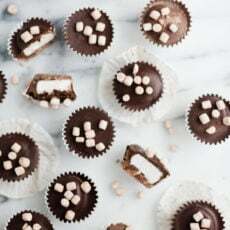 Its a pretty good combo, especially if you’re a chocolate lover. 6. Smarties popcorn! This is a fun one. And probably one of my favorites. Partially because of the pretty pastel colors and partially because Smarties are sort of the underdog of candies. I don’t know anyone that buys an actual bag of this kind of candy, BUT I also don’t know anyone who won’t eat a roll of Smarties if its in front of them Underrated? Yes. Delicious? Yes. 7. Kitchen Sink Popcorn. This one pretty much consists of dumping ALL of the ingredients from the above into one big bowl of popcorn. It’s sort of like popcorn trail mix, only there aren’t any pesky nuts or cranberries to skip over and sort through. This would be a great way to make use of all that extra Halloween candy laying around, after October 31st. So be sure to bookmark these popcorn recipes for later. 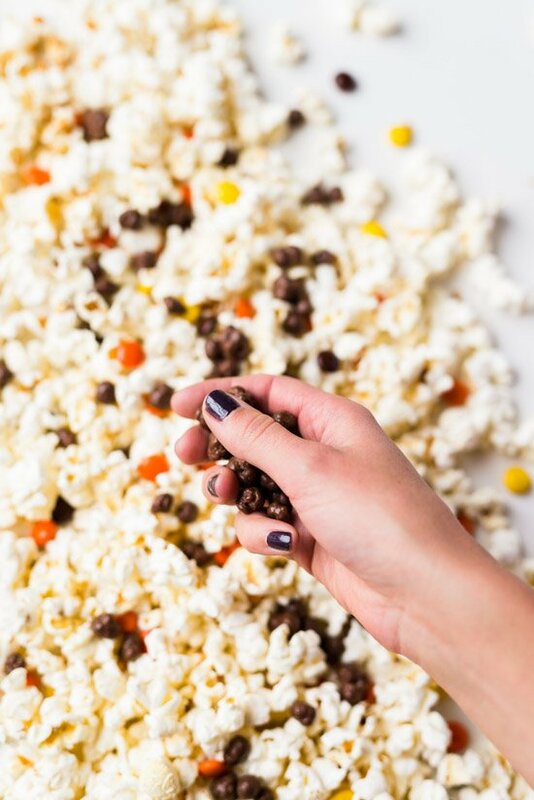 What topping do you like to toss in with your popcorn? Did I miss one of your favorites? I still have a few bags of popcorn leftover, so I’d love to hear your suggestions. I am a popcorn addict! I like sour licorice pieces. Odd, but yummy. I’ll have to try that one, Bella. I imagine its a lot like #4 on the list (which I loved). I am that one person that buys bags of smarties. They’re called rockets up in Canada, so I was a wee bit confused reading the caption and looking at the picture! Some great ideas though! All I want to do now is have a popcorn party!!!! And I’m texting my boyfriend now to let him know about the Lucky Charms marshmallows on popcorn! Lauren @ Oh Hey, I Like That! Yessss! My go-to at the movies is popcorn and Reeses pieces so I’ll have to add buncha crunch in there next time. These all look amazing! I love the chocolate lover popcorn…but that last one is probably the best! Time for a movie night! Did you mean snack as in something to eat and not snake as in reptile? Uh oh… Yes, I meant snack not snake, Catherine. Just fixed it. Thanks for catching that. Love these ideas. Smarites first came into my life when I lived in UK. I am obsessed with popcorn! These toppings sound delicious! You have to try candy corn, drop them in while the popcorn is still hot so they get all warm and soft, it is my favorite popcorn combo!